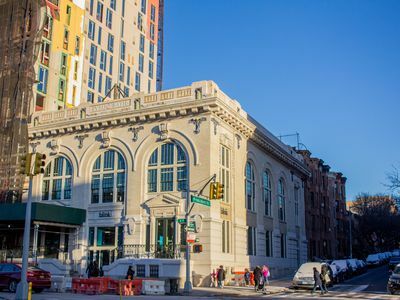 Greystone Development is looking for a buyer for Park Slope’s landmarked Brooklyn Lyceum, the 1900s bathhouse the company purchased at auction in 2014 for $7.6 million. Greystone funneled $5 million into rehabbing the aging building, and converted it into a Blink Fitness. They’re now looking to sell the property, on Fourth Avenue at the corner of President Street, for $10.5 million. Though it looks like Greystone is taking a hit for rehabbing the building on paper, Crain’s notes that the developer is using the building’s valuable air rights to build a 63-unit residential project on a neighboring lot. Greystone initially set its sights on converting the bathhouse into three townhouses, but changed course after Blink Fitness signed a lease for the space through 2033. The former public bathhouse had been owned for several years by Eric Richmond, who ran the arts and events space Brooklyn Lyceum from the building. Richmond was outbid for the space by Greystone in the 2014 auction. TerraCRG is exclusively marketing the property.